The Fool is the spirit in search of experience. He represents the mystical cleverness bereft of reason within us, the childlike ability to tune into the inner workings of the world. The sun shining behind him represents the divine nature of the Fool’s wisdom and exuberance, holy madness or ‘crazy wisdom‘. On his back are all the possessions he might need. In his hand there is a flower, showing his appreciation of beauty. He is frequently accompanied by a dog, sometimes seen as his animal desires, sometimes as the call of the “real world”, nipping at his heels and distracting him. He is seemingly unconcerned that he is standing on a precipice, apparently about to step off. One of the keys to the card is the paradigm of the precipice, Zero and the sometimes represented oblivious Fool’s near-step into the oblivion (The Void) of the jaws of a crocodile, for example, are all mutually informing polysemy within evocations of the iconography of The Fool. The staff is the offset and complement to the void and this in many traditions represents wisdom and renunciation, e.g. ‘danda‘ (Sanskrit) of a Sanyassin, ‘danda’ (Sanskrit) is also a punctuation mark with the function analogous to a ‘full-stop’ which is appropriately termed a period in American English. The Fool is both the beginning and the end, neither and otherwise, betwixt and between, liminal. A famous instance is the final dot at the end of the penultimate chapter. This was assumed to be a flyspeck and dropped, when in fact it was the obscure yet indispensable answer to the precise and final question, ”Where?” Joyce gave specific instructions to the printer to enlarge the dot rather than to drop it. This is now the perfect moment to segue from the card ‘the fool’ to the character type. 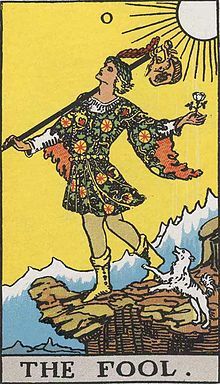 “Leap and the net will appear” is the happy heuristics motto that “the fool” evokes to me, with the special trust and protection he enjoys, always accompanying him. 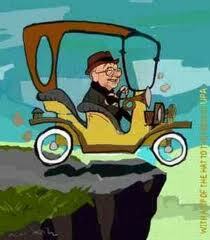 The hilarious cartoon, Dr Magoo, plays this thematic to death. Of course, there are the inescapable Shakespearean fools, King Lear‘s fool is my favorite; Faulkner’s; Hemingway’s; Steinbeck’s Lenny in Of Mice and Men; Twain’s Tom Sawyer and Huck Finn, that deliver the hardest of truths about life’s absurdity, in the most persuasive way: through the perspective lens of a diminished, defective, hero in some way or another (the child, the retarded, the cripple, the madman, the neurotic, the innocent). The reader seized with compassion is powerless to help these fools, which accounts for life’s pathos better than with a prototypical hero . There are also the Picaros, like Defoe’s Moll Flanders and Fielding’s Tom Jones, which are also evocative of some aspect of the fool, who fools destiny through unlikely plots, hence the complexity of the thematic. Who hasn’t both laughed and cried at watching Forest Gump (Tom Hanks), the retarded, the cripple, telling the American saga of Vietnam War, Civil rights and Aids through the story of his life and loves and unflinching of luck ! A less obvious reference to the fool and fool’s luck theme, in cinema, is Blondie/The Good (Clint Eastwood), with Tuco, his rogue ‘companion'(Eli Wallach), and its indictment of War in a Spaghetti Western. The moment when Blondie, the good, gives, the young confederate soldier his last drags before his last sigh, from his fetish cigarette, is poignant with the tragic of all the young men lost at war (here a civil war, a war of brothers), whichever camp they belong. That’s something in cinema! I am working on my pet “fool” Icarus in Icaresques. Maybe this new aspect of the fool will illuminate your path. Writing about him surely illuminates mine. The Cliché “a picture is worth a thousand words”is particularly suited for the work with associative/metaphoric cards. Metaphoric cards have the power to evoke and connect us to the rainbow of human memories, experiences and connections, through non-linear ‘thinking and in one stroke of ‘insight’, so to speak. All the examples, I’ve listed above, and more, came to me only while looking at the Tarot’s fool card. This picture will certainly connect to countless other inner pictures. As I am writing now, I think of Little Big Man with Dustin Hoffman, for example. Of course, my internal ‘universe’ is not only filled with references from culture, but culture informs our journey, and it is useful to see at intervals how we’ve grown from the images that inhabit us. You don’t need to probe the future for answers : answers may be found in the fool’s journey, reflecting back your own journey, unfolding your destiny through the trust and courage needed to engage in it-in spite of the danger- and illuminate your own path. Speaking as a Chinese, I do not think that any civilization can be called complete until it has progressed from sophistication to unsophistication, and made a conscious return to simplicity of thinking and living, and I call no man wise until he has made the progress from the wisdom of knowledge to the wisdom of foolishness, and become a laughing philosopher, feeling first life’s tragedy and then life’s comedy. For we must weep before we can laugh. Out of sadness comes the awakening and out of the awakening comes the laughter of the philosopher, with kindliness and tolerance to boot.